A post on Download Squad, shared by Vlad (an old Jaiku contact), reminded me that I’ve been meaning to sort out a new alternative to the stupidly bloated Adobe Reader. I’ve been a long time user of Foxit Reader, but over the last while this piece of software has increased in size, gotten much slower on load time, and worst of all, started to use dubious practices in tricking you to install crapware – the worst of all being as displayed in the screenshot below. 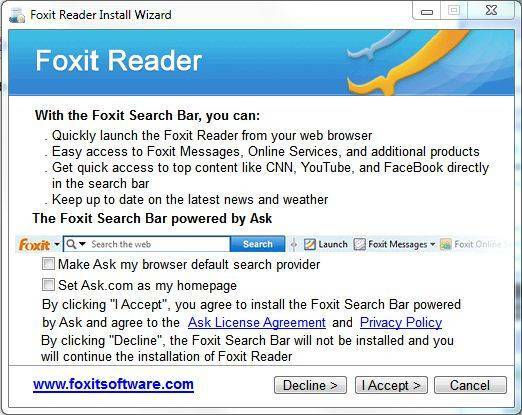 This nasty tactic makes you think you’re deselecting items you don’t want and then, if you aren’t paying attention, your default reaction is to click “I accept” assuming that you’re accepting the installation of Foxit Reader without the unwanted crapware. No no. This means you’re accepting the install of yet-another-useless-browser-toolbar but not using Ask as your homepage/default search. This nearly caught me out, and I’m a seasoned computer user wary of such things. As a result I will no longer be suggesting Foxit software as an alternative to Adobe. Now I need recommendations on new alternatives. I’ve tried Sumatra, but it’s missing out on text selection. In fact, pretty much the only feature I need in a PDF reader is being able to read the document and text selection – I need no other features. Anyone got a recommendation? If so I’d love to hear about it in the comments.